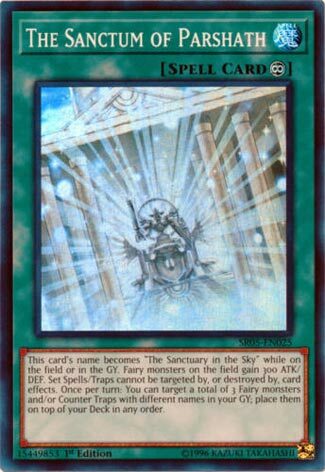 This card’s name becomes “The Sanctuary in the Sky” while on the field or in the GY. Fairy monsters on the field gain 300 ATK/DEF. Set Spells/Traps cannot be targeted by, or destroyed by, card effects. Once per turn: You can target a total of 3 Fairy monsters and/or Counter Traps with different names in your GY; place them on top of your Deck in any order. Parshath week starts up with an awesome new Field Spell for the deck, but something that could be used outside the archetype: The Sanctum of Parshath. Fairy-based Field Spell that takes on the same of their forebearer: The Sanctuary in the Sky, it will benefit any Fairy requiring “The Sanctuary in the Sky” for an effect, or card needing it present, a must for dedicated Fairy-based support. 300ATK/DEF is nice, but with Honest and other ATK boost support, this ATK boost isn’t much. Total destruction protection for set spell/traps is amazing. Now you don’t need to worry about being slammed by a blind MST or Twin Twister, or Masterpiece being dropped to wreck your backrows day. Protect Sanctum of Parshath and it will protect you. The recycle ability is fantastic for Counter Fairy decks, Fairy decks, or any deck that runs a decent amount of Counter Traps. Any 3 from either Fairy monsters or Counter Traps to the top of your deck in any order may be adding back to your deck, but if you set that up with a draw card you will be adding those directly to the hand. Your opponent may know what is coming next, but if you are stacking a Strike, Warning, and a Dark Bribe what are they really going to do? This was a much-needed support effect the deck needed to get back resources and the fact that you can do it once per turn is even better. Drastic protection for backrows and resource gathering in a balanced way makes for an awesome card. This belongs in 3’s in Counter Fairy and Fairy decks. Counter Trap-heavy decks can run this as a way to recycle their traps, and any deck that runs Field Spell cards that also run a lot of backrows could think about this as a potential option. The Sanctum of Parshath of Parshath is a Continuous Spell Card that is named Sanctuary in the Sky while on the field or in the grave. It is a significantly better version of Sanctuary in the Sky because it actually does something useful, specifically providing offense for Fairy’s. Original Sanctuary only provided minor Life Point protection from battle damage. This one makes all Fairy’s gain 300 Atk and Def. Then, Set Spells and Traps cannot be targeted by or destroyed by card effects. This is an excellent protection method for Counter Traps and even all the mirror forces. I would also consider Sanctum of Parshath as a side deck option against decks that use Artifacts because those monsters wouldn’t be able to use their own destruction cards on their own set “Spells.” Finally, you can get three Counter Traps or Fairy’s out of the grave and put them on the deck in any order. That effect makes new Sanctum good in mid to late game when your grave is full. I also like that multiple Sanctum could gain 900 Atk and Def for Fairy’s. Yeah, versatile searchable and useful. Sanctum of Parshath is great for and against some decks. I did the What You Should Know on this deck a few days ago, but now it seems we get to actually review the cards for the deck. For those that don’t know, Wave of Light is the newest Reloaded Structure Deck, despite the TCG never getting the original one, and this deck is meant to further boost Counter Fairies. The first card we will review in this Counter Fairy week is a retrain of The Sanctuary in the Sky, Sanctum of Parshath. Sanctum of Parshath is a Continuous Spell, unlike the original Sanctuary in the Sky which is a Field Spell, meaning no Terraforming. However, being a Parshath card makes it searchable now by the boss monster, which we will review. 😉 Being a retrain of The Sanctuary in the Sky, it is obviously going to be treated as The Sanctuary in the Sky somewhere, in this case on the field or in the GY meaning you can still play the original since this isn’t always The Sanctuary in the Sky. This also gives the card synergy with cards that work with The Sanctuary in the Sky like Divine Punishment. Fairy monsters you control gain 300 ATK and DEF. Respectable boost, especially for boosting Bountiful Artemis from a mediocre 1600/1700 to a solid 1900/2000. Once per turn, you can choose 3 Counter Traps or Fairy monsters with different names and place them on top of the deck in any order. A great way to recycle Counter Traps and Fairy monsters, something the Counter Fairy deck needed. Honestly, this is a really good retrain of The Sanctuary in the Sky, despite having no effects similar to the original except for supporting Fairies.